I don’t know why I feel the need to celebrate every holiday or event with a t-shirt but for some reason I do. I asked Sasha the other day what kind of shirt he wanted for Valentine’s day and he said one with a big heart on it. So armed with a couple of white shirts and red felt I cut out some hearts, pinned them on and got Sasha’s approval. By the looks of the photo you might be able to see that the first heart that I cut for him wasn’t big enough, unfortunately I was out of red felt. I love that Sasha is interested and engaged in all things handmade so I am willing to find a way to make his vision a reality. I was not in the mood to go to the store with 2 kids in tow to get one sheet of red felt, so a quick text to a crafty friend and I was ready to cut a very large heart for Sasha’s shirt. With Sasha’s design approval I stitched the hearts on with embroidery thread. 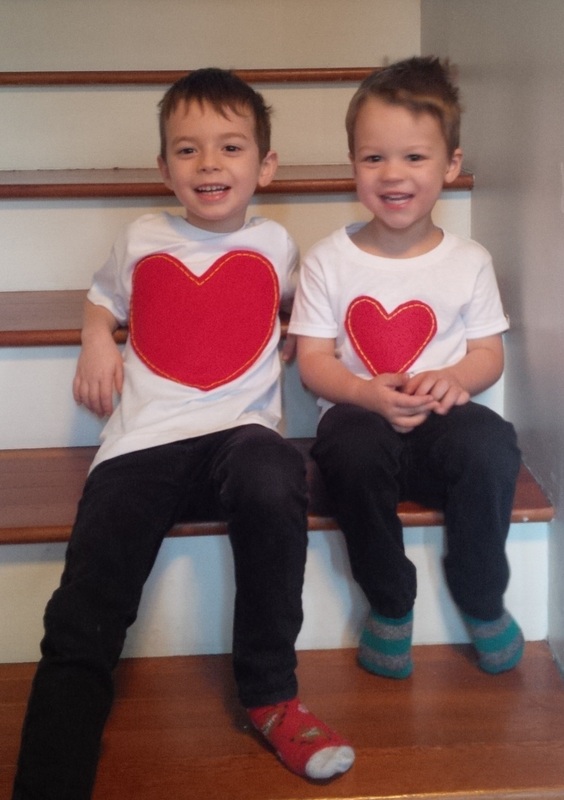 Here are my boys in their love shirts, aren’t they the cutest?